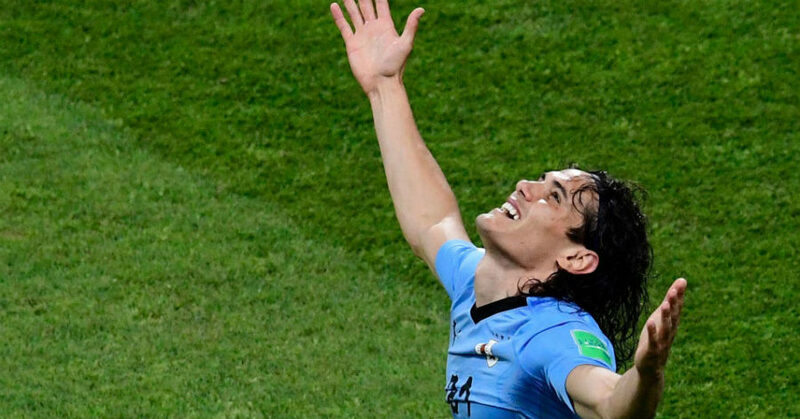 SOCHI, Russia — Edinson Cavani scored twice and Uruguay eliminated Cristiano Ronaldo and Portugal from the World Cup with a 2-1 win in the round of 16 at Fisht Olympic Stadium on Saturday. The victory for Uruguay see them joining their next opponents, France, in the next round, while Ronaldo joined La Liga rival Lionel Messi as two of the tournaments superstars out of the World Cup on the same day. Cavani broke the deadlock for Uruguay in the seventh minute when he headed home powerfully off a cross by his strike partner Luis Suarez. Uruguay conceded its first goal of the 2018 World Cup when experienced centre-back Pepe equalized for Portugal in the 55th minute. However, Cavani struck again with a perfectly-placed side-footed shot to restore the lead for the South Americans in the 62nd minute and they held on to progress to a World Cup quarterfinals for the first time since finishing fourth at the 2010 edition in South Africa. There were be some anxious moments, though, for the two-time world champion after Cavani limped off the field in the 74th minute and was helped by Ronaldo. “I tweaked my calf. Strains like that can be tricky injuries; I’ll have to undergo tests to see how serious it is,” said Cavani. Ronaldo, who has scored four goals in the tournament, was unable to break loose from the Uruguay defenders and was even booked in frustration towards the ending minutes of the contest. The European champion also missed a number of late chances to potentially send the match into extra-time. France, which ousted Messi and Argentina 4-3 earlier Saturday, will next face Uruguay in a quarterfinal match next week.